RAS family genes, including HRAS, KRAS and NRAS, are the most common oncogenes in human cancer, and encode extremely similar proteins made up of chains of 188 to 189 amino acids. The sequences and structural features of these three proteins are highly conserved, except for their carboxyl-terminal domains and post-translational lipid modifications [1, 2]. HRAS, KRAS and NRAS are regulated in a similar manner within the cell. The RAS genes encode monomeric GTPases that function as molecular switches in signal transduction pathways regulating cell proliferation, differentiation and survival in mammalian cells . Mutations that can constitutively activate RAS have been found in 20% ~ 25% of all human cancers . KRAS has the highest mutation rate compared to HRAS and NRAS in various types of cancers [4, 5]. KRAS is a proto-oncogene and its gene product was first found as a p21 GTPase. KRAS binds to GTP in its active state and possesses an intrinsic enzymatic activity which cleaves the terminal phosphate of the nucleotide, converting it to GDP. Upon conversion of GTP to GDP, KRAS is deactivated. The rate of conversion is usually slow, but can be increased dramatically by an accessory GTPase-activating protein (GAP) . In turn, KRAS can bind to guanine nucleotide exchange factors (GEFs) (such as SOS), which force the release of bound nucleotide (GDP). GTP binding enables several residues, primarily in the switch I region (residues 30–40) and switch II region (residues 60–70), to adopt a conformation that permits KRAS effector proteins to bind; these switches are regulated by GAPs and GEFs [6, 7]. In mammalian cells, endogenous KRAS proteins are predominantly in the GDP state and activation is transient . However, the common oncogenic mutations in KRAS proteins interfere with GTP hydrolysis, resulting in proteins that remain in the active GTP state and continue to transmit signals to effector pathways . Thus, KRAS acts as a molecular on/off switch. Once it is turned on, it recruits and activates proteins necessary for the propagation of signaling of growth factors and other receptors, such as c-Raf and PI3K [9–12]. Somatic KRAS mutations are found at high rates in leukemia [13, 14], colorectal cancer , pancreatic cancer  and non-small cell lung cancer (NSCLC) . In NSCLC, KRAS mutation is observed in up to 30–40% of cases [11, 12, 18]. The most common KRAS mutations include G12C, G12D, G12R, G12S, G12 V, G13D and Q61H [19, 20]. Beyond the most common hotspot alleles in exons 2 and 3, mutations in exon 4 of KRAS, including K117 N and A146T, have also been found in patients with colorectal cancer [21, 22]. 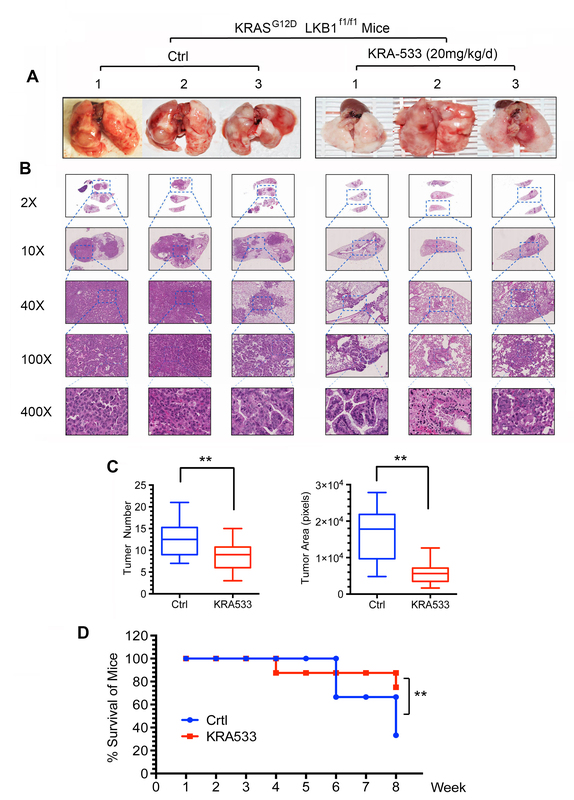 KRAS mutations constitutively activate KRAS and subsequently its downstream Raf/MEK/ERK1/2 and PI3K/PIP3/AKT survival pathways in various cancers, including lung cancer [9–12]. However, over the past two decades, evidence has gradually accumulated to support a paradoxical role for RAS proteins in the initiation of cell death pathways [1, 23–25]. Hyperactive RAS forces cells into the pathway of programmed cell death . Vitamin C treatment selectively kills mutant KRAS expressing tumor cells, but not wild-type KRAS containing cells . Interestingly, either glucose withdrawal or glucose-mediated hyperactivation of RAS is able to trigger apoptosis [26, 28]. RAS oncogenes trigger apoptosis only under specific conditions . Thus, manipulation of the opposing functions of KRAS in cell proliferation/survival versus cell death should be an attractive approach to develop new strategies for the treatment of various types of cancers, especially those with mutant KRAS. Currently, there are no effective targeted therapies for patients with KRAS mutant cancers [29, 30]. KRAS has been considered an “undruggable” target and it is difficult to inhibit its intracellular activity [5, 31] for the following reasons : first, whether KRAS adopts an active or inactive form depends on its GTP or GDP binding status rather than it being a substrate of catalytic reactions; second, there is a picomolar affinity between KRAS and GTP while micromolar concentrations of GTP exist in cancer cells; third, KRAS lacks a sufficiently large and deep hydrophobic pocket for small molecule binding, aside from the challenging nucleotide-binding site [4–6, 32]. Therefore, numerous efforts made by industry and academic laboratories have failed to design a drug to inhibit KRAS activity in cancer cells by directly targeting KRAS. 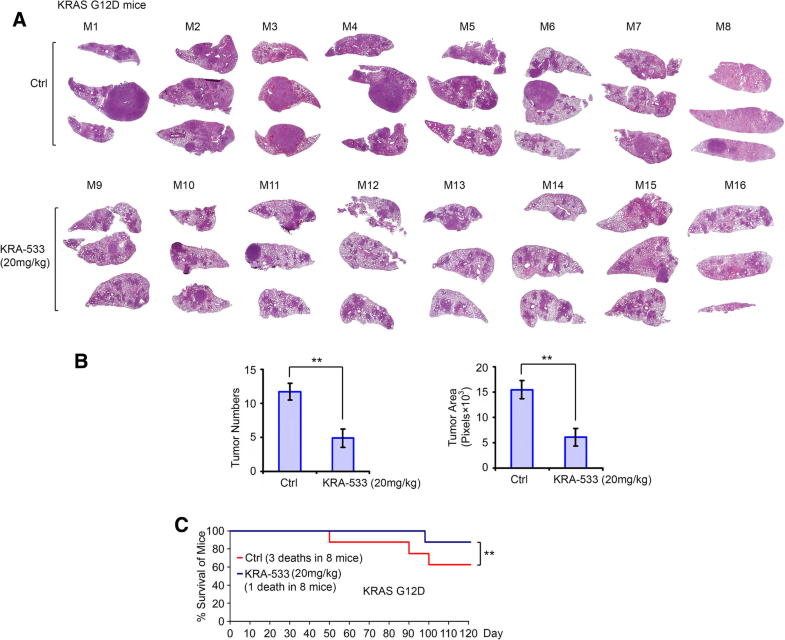 Since intracellular KRAS activity is difficult to disrupt, and activated KRAS has been demonstrated to trigger death pathways , changing the nature of KRAS signaling from pro-survival to pro-death by directly targeting KRAS in cancer cells may represent an entirely new strategy for cancer therapy. 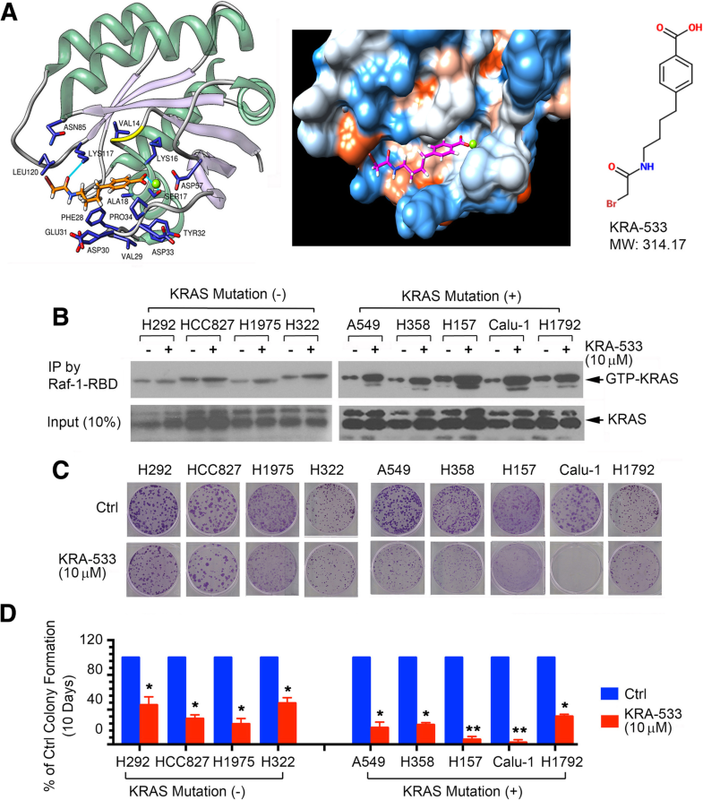 Here we identified KRA-533 as a novel KRAS agonist that binds to the GTP/GDP binding pocket in the KRAS protein to prevent GTP cleavage, resulting in the accumulation of constitutively active GTP-bound KRAS that triggers both apoptotic and autophagic cell death pathways in cancer cells, leading to potent suppression of mutant KRAS lung cancer in vitro and in animal models. A library containing ~ 300,000 small molecules from the National Cancer Institute (NCI) was employed to dock the GTP/GDP binding pocket of KRAS (PDB ID code: 4EPT) using the University of California, San Francisco (UCSF) DOCK 6.1 program suite as we previously described [49–51]. The small molecules were ranked according to their energy scores. Top 500 small molecules with predicted binding energies were selected for screening of cytotoxicity in human lung cancer cells by sulforhodamine B (SRB) assay as previously described. Among these small molecules, the compound NSC112533 (C13H16BrNO3, molecular weight [MW] 314.17) had the most potent activity against human lung cancer cells. We named this lead compound small-molecule KRAS agonist-533 (KRA-533). The molecular modeling of KRA-533 in complex with KRAS GTP/GDP binding pocket is shown in Fig. 1A. It has recently been reported that activated KRAS can trigger cell death via apoptosis and autophagy-associated cell death in cancer cells [1, 23–25]. 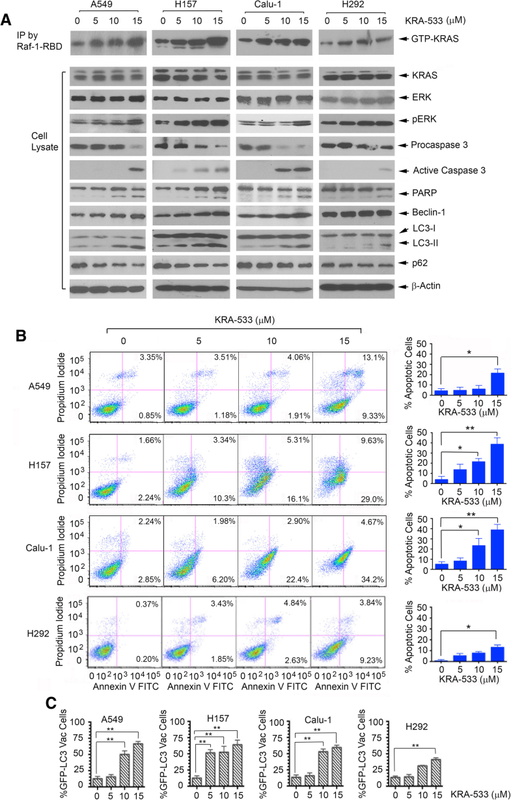 To test whether KRA-533-activated KRAS promotes apoptosis and autophagic cell death, A549, H157, Calu-1 and H292 cells were treated with increasing concentrations of KRA-533 for 48 h, followed by analysis of KRAS activity, apoptosis and autophagy. KRA-533 enhanced KRAS activity in a dose-dependent manner, which was associated increased levels of pERK, ratio of active caspase 3/procaspase 3 and PARP cleavage, leading to apoptotic cell death determined by FACS analysis of Annexin V/PI staining (Fig. 4A and B), measurement of caspase 3 activity using a Caspase 3 Colorimetric Assay Kit and mitochondrial membrane potential using JC-1 staining (Additional file 2: Figure S2). We also measured autophagy by analysis of LC3-I/LC3-II and p62 following treatment of cells with KRA-533. It is well known that p62 is an autophagy receptor or substrate that can be degraded by autophagy . 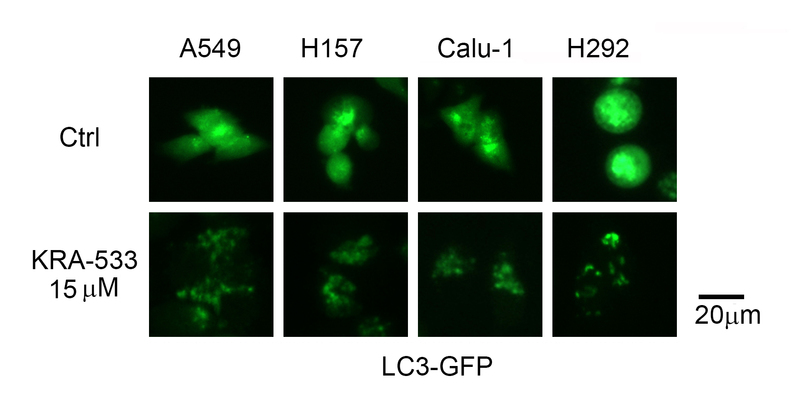 In addition to LC3-II, we analyzed p62 as another autophagy marker. 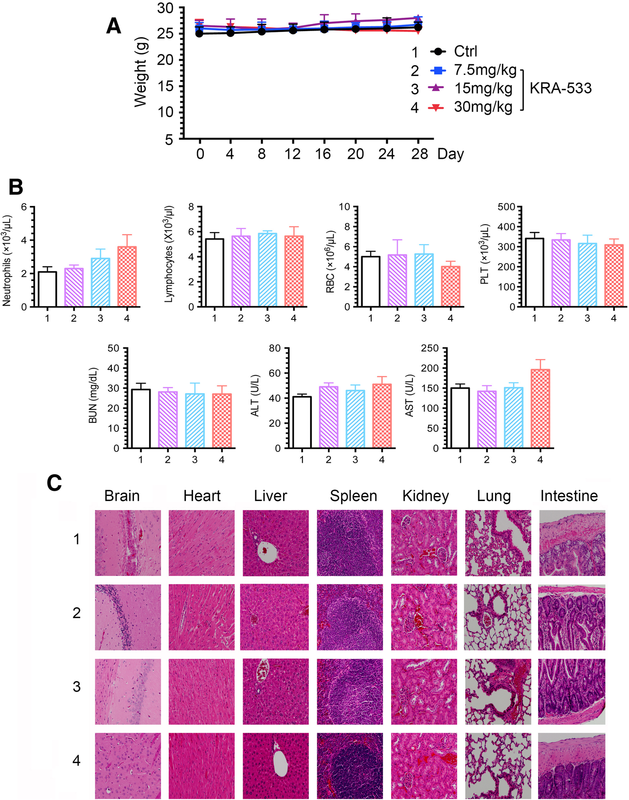 Intriguingly, KRA-533 induced a dose-dependent increase of LC3-II and a dose-dependent decrease of p62 in A549, H157, Calu-1 cells and H292 (Fig. 4A). To further quantify the level of autophagy, a GFP-LC3 construct was used to indicate autophagosomes as previously described [49, 53]. After treatment with KRA-533, GFP-LC3 redistributed from a diffuse staining pattern in the cytoplasm and nucleus to a cytoplasmic punctate structure that specifically labels pre-autophagosomal and autophagosomal membranes (i.e. GFP-LC3 vac cells, Additional file 3: Figure S3). 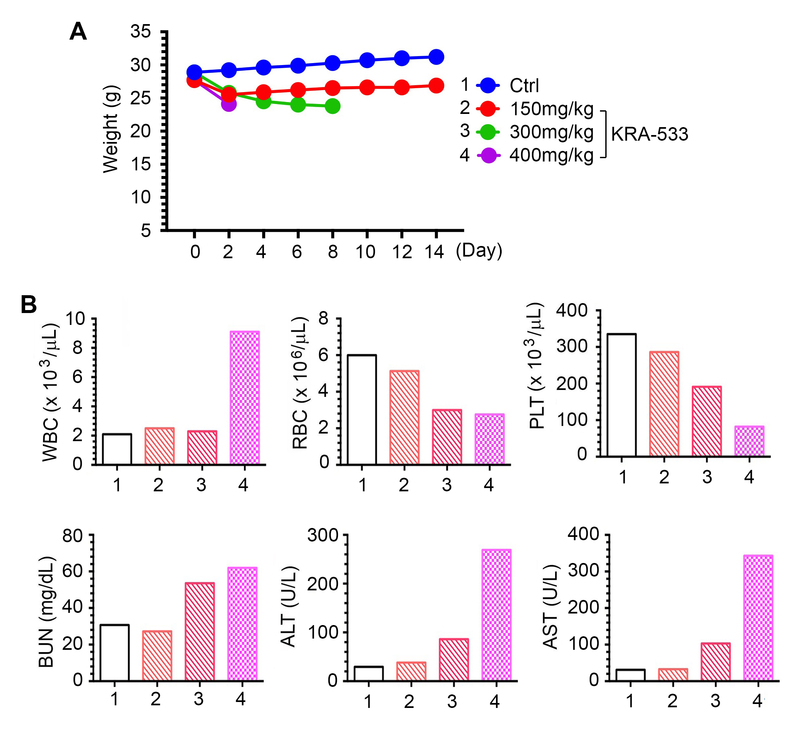 Intriguingly, KRA-533 enhanced the percentage of GFP-LC3vac cells in a dose-dependent manner (Fig. 4C). These findings indicate that, in addition to apoptosis, KRA-533 can also induce autophagic cell death. 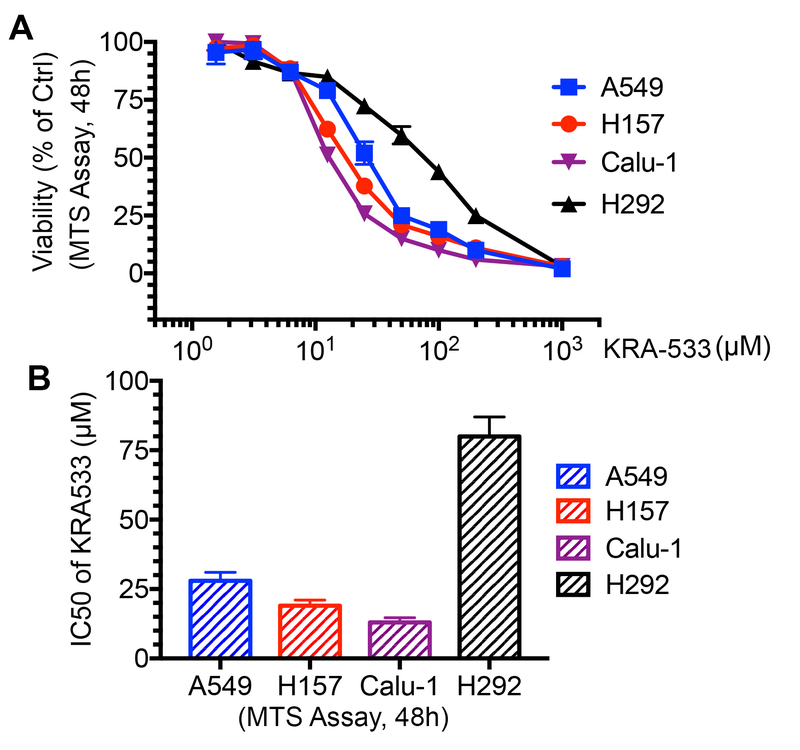 Importantly, A549, H157 and Calu-1 cells with KRAS mutation were significantly more sensitive than H292 cells without KRAS mutation to KRA-533-stimulated KRAS activation, induction of apoptosis and autophagy (Fig. 4), suggesting that KRA-533 may be relatively selective for cancer cells bearing KRAS mutation(s). RAS has opposing functions in cell proliferation/survival versus cell death pathways [1, 23–25]. Here we used the GTP/GDP-binding pocket of KRAS as a docking site to screen the NCI library of small molecules using the UCSF-DOCK program suite. KRA-533 was identified as a lead compound that targets the GTP/GDP-binding pocket in KRAS protein. 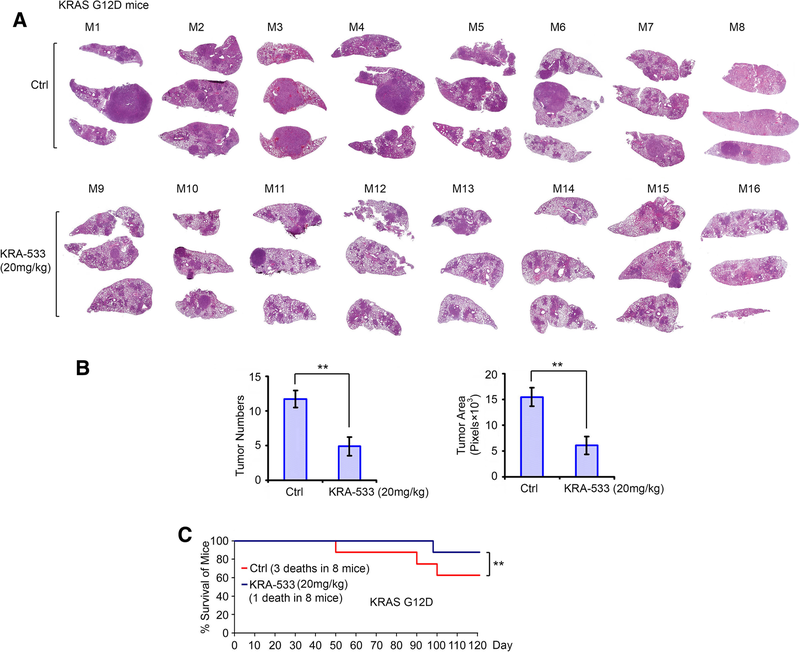 KRA-533 potently enhances intracellular KRAS activities to various degrees in a series of human NSCLC cell lines in association with various degrees of growth inhibition. 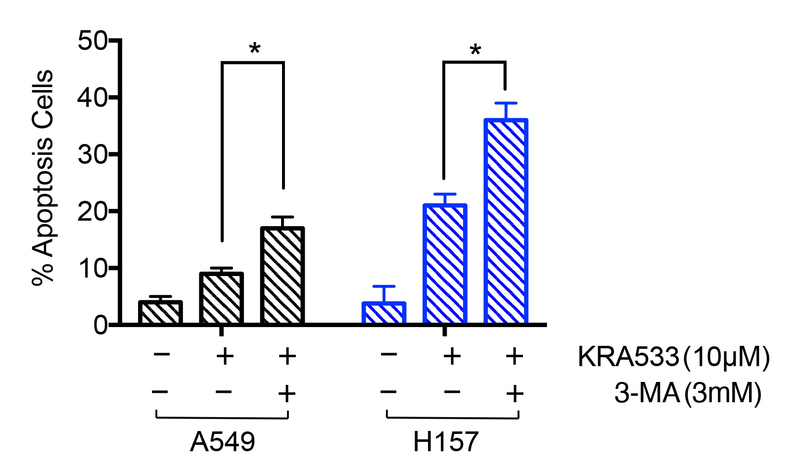 Intriguingly, lung cancer cell lines bearing KRAS mutation are more sensitive to KRA-533 than those without KRAS mutation, indicating KRA-533 may be relatively selective for mutant KRAS lung cancer cells. 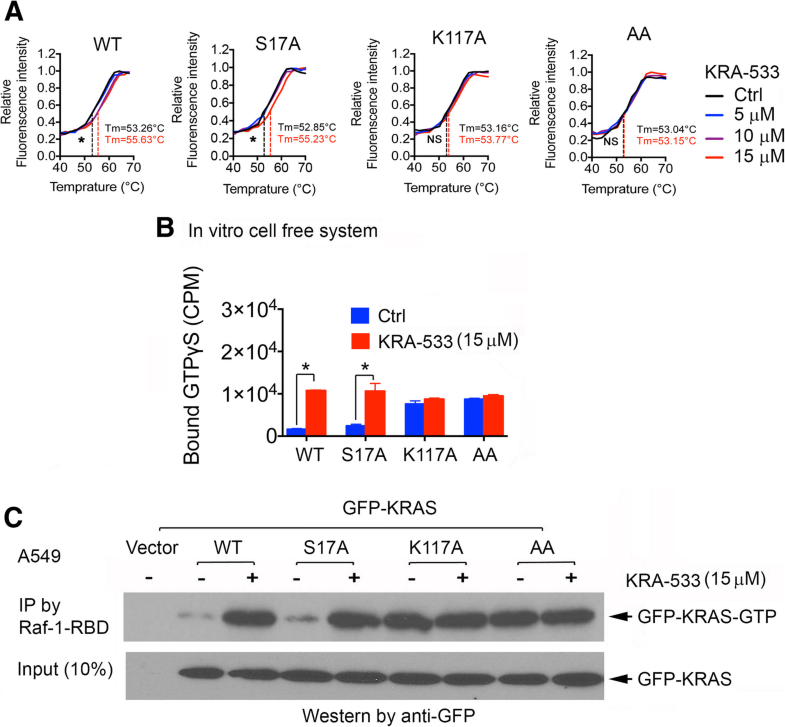 KRA-533 not only directly binds to WT KRAS protein but also KRAS mutants, including G12C, G12D and G13D. Although KRAS mutants have higher levels of activities than WT KRAS before KRA-533 treatment, KRA-533 induces a dose-dependent increase in activity of WT and mutant KRAS in cell-free GDP-GTP exchange assay and in lung cancer cells. 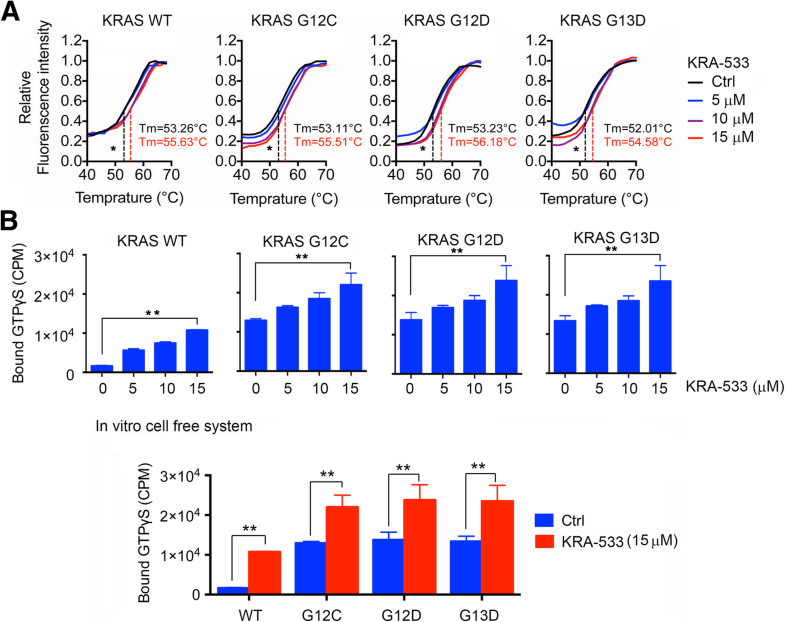 Compared to WT KRAS, the G12C, G12D and G13D KRAS mutants become hyperactive following KRA-533 treatment. It has been reported that glucose withdrawal or glucose-mediated hyperactivation of RAS is able to trigger apoptosis [26, 28]. 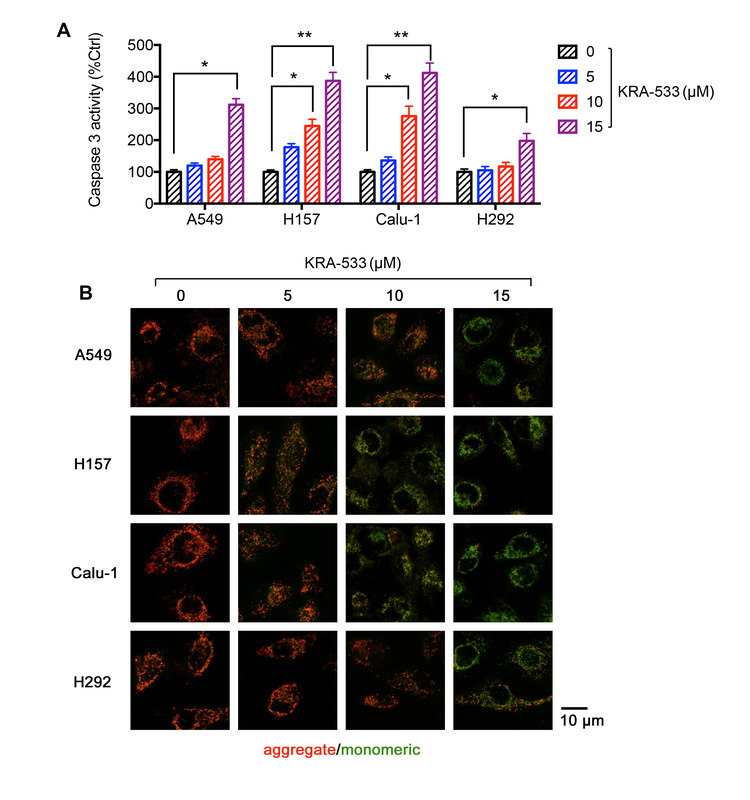 Hyperactivation of RAS can also trigger autophagy-associated cell death . 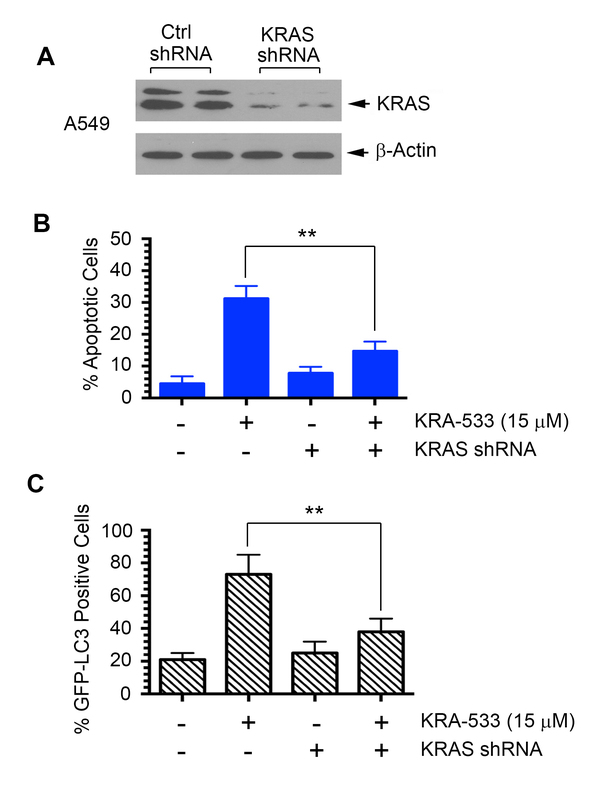 Here we found that KRA-533-induced hyperactivation of mutant KRAS led to apoptosis and autophagic cell death in mutant KRAS lung cancer cell lines (i.e. A549, H157 and Calu-1). 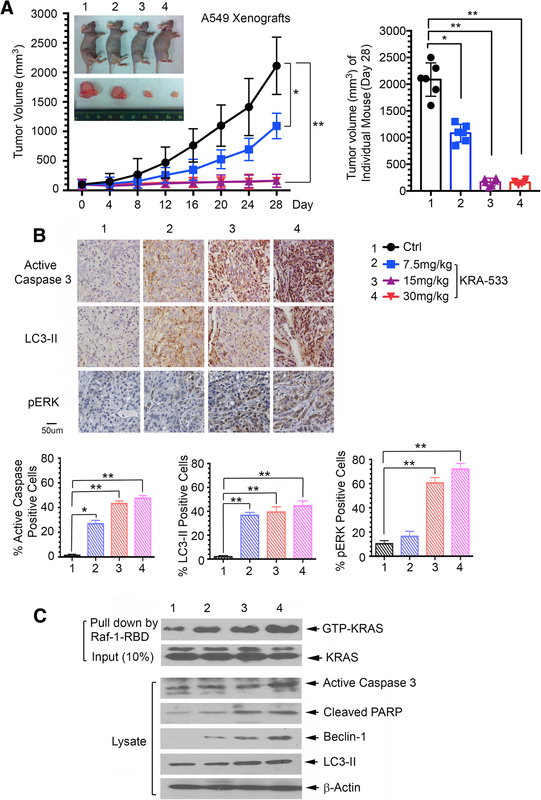 In contrast, the moderate level of WT KRAS activation induced by KRA-533 caused significantly less apoptosis and autophagic cell death in a lung cancer cell line without KRAS mutation (i.e. H292). Therefore, there may be a threshold of KRAS activity in cells to dictate pathway choice between survival and death. Based our findings and previous reports, we propose that KRAS activity at or below the threshold may promote cell survival and proliferation while KRAS activity beyond the threshold (i.e. hyperactivation or super-activity) may promote cell death. 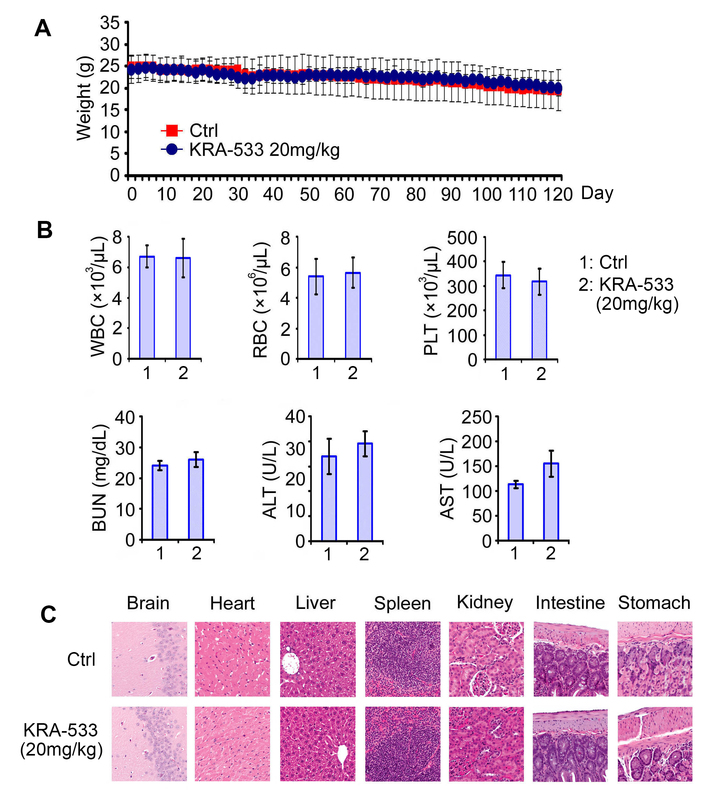 KRA-533 may change the nature of KRAS signaling from pro-survival to pro-death by stimulating active mutant KRAS to a super-active status that is beyond the activity threshold.